Cromwell is an implementation of our algorithms for low-level processing of mass spectrometry proteomics data. Cromwell uses the undecimated discrete wavelet transform to denoise spectra; a critical parameter is the threshold to use for denoising. We have developed graphical tools to aid users in making this decision. sizerPrep.m: This function smooths the raw spectrum intensities and returns the information in the form of a matrix. 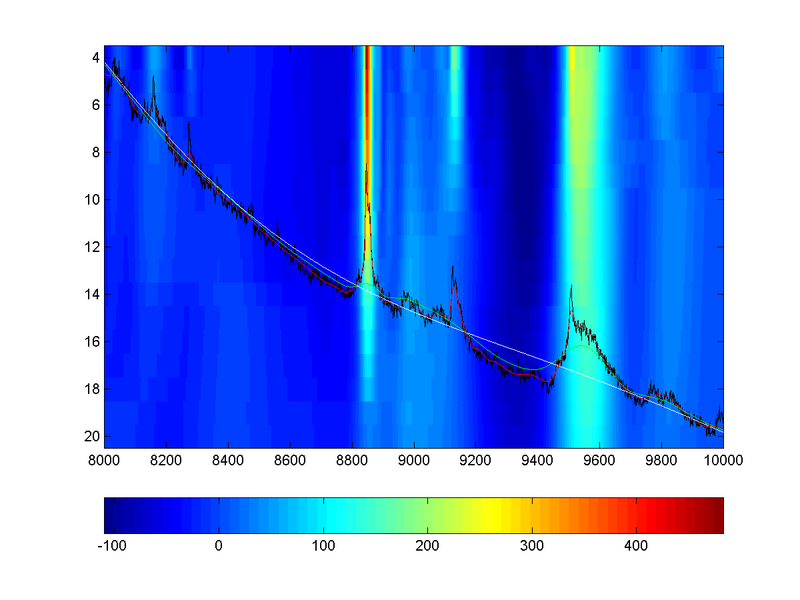 sizerPlot.m: This function produces a graph containing a heatmap of the deviations of the smooth spectra from the “infinitely smoothed” spectrum, along with overlays of the raw spectrum and the smooths corresponding to the minimal and maximal displayed thresholds. We have provided a readme file and two MATLAB scripts in a zip file. This documentation is included in the readme file of the download package. This package consists of two MATLAB functions to assist users with choosing the thresholds for wavelet denoising using the Cromwell package. corresponding to the minimal and maximal displayed thresholds.